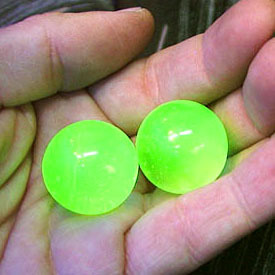 Radioactive Uranium Doped Glass Marbles, approximately 1" diameter. The marbles contain approximately 3% Uranium 238 ( by weight ). This small amount of Uranium is added to the glass while it's still in the furnace and in a molten state. As the Uranium dissolves into the red-hot glass, it takes on the tell-tale pale green color of Uranium Glass. Because of the added Uranium in the glass, the marbles glow brightly under Ultraviolet light ( Blacklight ). 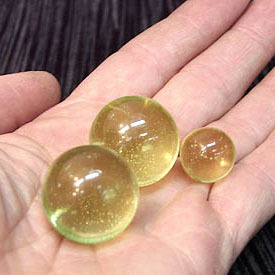 The small amount of radiation that the marbles emit will also register on sensitive Geiger Counters. They do not emit high or dangerous levels of radiation, and are completely safe to handle. Package of 2 marbles with certificate of measured radiation. Collectors take note: Uranium Glass is becoming increasingly difficult to obtain. Although a few glass manufacturers still have small quantities available, we do not expect this product to be available for very long unless Uranium Glass manufacturing resumes.